A few weeks ago, I was stressed - seriously stressed to the point of it affecting my health. I was feeling anxious, having headaches, and didn't sleep too well at night. There were several things on my mind at the same time - things that needed to be dealt with in different ways - things like settling a misunderstanding, feeling concern over a loved one's situation and making plans for some possible changes to take place, seeking answers from someone I wasn't very comfortable going to for help, having feelings of failure over raising and educating my children, and having feelings of being unappreciated. It was a lot to be dealing with all at once, and I came to the point where the only words I could mutter up in my prayers were, "God, please help me." When two friends came over for a Bible study that week, I shared some of my struggles with them, and asked if one of them could say the closing prayer. I wasn't in the right frame of mind to be audibly praying at the time. Not because I quit believing, not because I believed God wouldn't hear me. I just didn't have the words. A few days later, almost everything on my list was resolved, or in the process of being resolved, and I was able to pray more specifically again. 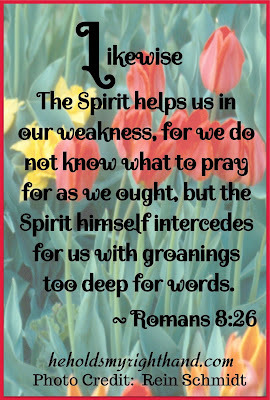 But, I later found out, one of my friends' husbands was encouraged to hear about my lack of words for openly praying. It may sound odd that he was encouraged by my discouragement. But, he said it made him realize he is not alone when he goes through the same thing. So, SOMETIMES, when we go through a hard time, it could actually be happening for someone else's benefit. But, no matter the reason for WHY these things happen, it is important for us all to remember how God understands what we are going through. He understands our hearts. He understands our needs. 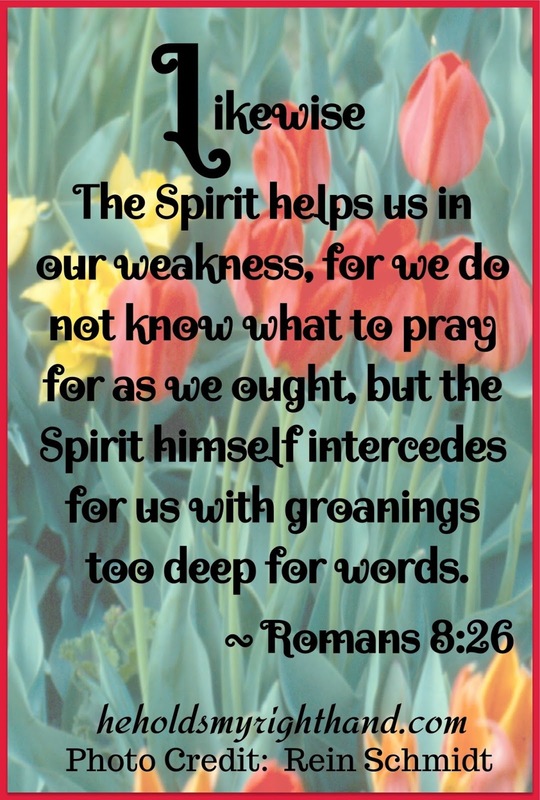 So, even when we cannot express ourselves in words, we can take comfort in knowing the Holy Spirit will do the praying for us, and God WILL listen and respond. God is good. TRUST Him to listen to your heart, even when you don't have the words.